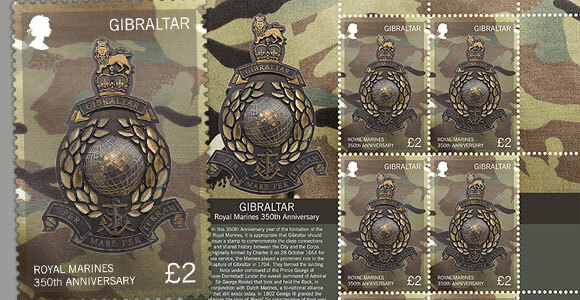 In this 350th Anniversary year of the formation of the Royal Marines, it is appropriate that Gibraltar should issue a stamp to commemorate the close connections and shared history between the City and the Corps. Originally formed by Charles II on 28 October 1664 for sea service, the Marines played a prominent role in the capture of Gibraltar in 1704. They formed the landing force under command of the Prince George of Hesse-Darmstadt (under the overall command of Admiral Sir George Rooke) that took and held the Rock, in conjunction with Dutch Marines, a bi-national alliance that still exists today. In 1802 George III granted the Marines the style of ‘Royal’ “in consideration of their very meritorious service during the late war.” In 1832 it was decided that the Royal Marines had so many battle honours that the Corps should have the ‘Great Globe itself’ as their distinctive badge, whilst the single honour ‘Gibraltar’ was selected on the Colours as representative of all the others won by the Corps. The connection has continued ever since and in 1996 the Royal Marines were granted the Freedom of the City of Gibraltar. The Royal Marines are an integral part of the Royal Navy and provide the core of the UK amphibious expeditionary capability. Following the 2nd World War the Corps took on the Commando role and all marines are now commando trained and wear the green beret. Operating in all environments and climates they have particular expertise in arctic, mountain and desert warfare. The major units generated are 3 Commando Brigade, a unit that protects naval assets at home and overseas and the Special Boat Service; indeed the RM provides around half of all UK’s Special Forces. The Corps has been involved in every major operation and war over the last 350 years and in recent years has played a prominent part in operations in Iraq and Afghanistan. The Royal Marines have close international ties with other marine forces, in particular the United States Marine Corps and the Royal Netherlands Marine Corps.